Can sharing an electric motorbike with neighbors become an attractive alternative to Grab and Go-Jek’s motorbike taxis? The bike-sharing craze, where we saw Chinese companies like Mobike and Ofo scale up at breakneck speed—and then tumble—only grazed Southeast Asia. Ofo entered several Southeast Asian countries, but barely moved beyond the trial phase (with the exception of Singapore) before the firm was on global retrenchment and left many with the feeling that bike-sharing is doomed to fail. Even at the peak of the hype, no firm was brazen enough to bring bicycle-sharing to Jakarta, where traffic conditions are not conducive and cycling is not a widespread cultural practice. Motorbikes, however, are ubiquitous in Indonesia’s capital, as they are in many other Southeast Asian metropolises, including Bangkok and Ho Chi Minh City. Grab and Go-Jek built their local services and delivery empires based on this. A pair of Chinese entrepreneurs believe that there is business to be done in these cities based on a use case similar to motorbike taxis. They want to bring motorbike sharing to the region. Their one-year-old startup, Migo, is already backed by Chinese VC Legend Capital and LCIG, hardware maker Lenovo’s venture fund. In Migo, riders rent a motorbike from a station by paying a small fee, and then return it when they’re done. It costs IDR 3,000 (US$0.2) per 30-minute slot, with no limit to the travel distance. That’s cheaper than most short-distance Go-Jek or Grab bike rides. This appeals to people who need a bike to run several errands, and who prefer the freedom of driving themselves. Migo’s motorbikes aren’t really “motor” bikes—they’re electric. They recharge overnight at their station and can travel up to 50 kilometres on one charge, says Migo chairman Howard Yu. It’s his first time running a tech-based business. Yu and his co-founders were in the logistics and shipping industry before they launched Migo. This business frequently brought them to Indonesia, and Yu says they had been mulling the idea of launching Migo since 2016, when they saw how Go-Jek’s motorbike taxi service took off. Undeterred by the fate of Ofo and others, Yu believes electric motorbike sharing in Indonesia and potentially other Southeast Asian cities will play out differently. Migo is a Hong Kong-registered company, with offices in Indonesia. It chose Surabaya, Indonesia’s second largest city, as a launchpad last year, introducing a small fleet of bikes onto the street. That was to collect data and experience, says Yu. A key observation the team made in Surabaya is that customers tended to take good care of their borrowed bikes, returning them in good shape and self-reporting if they had caused any damage. 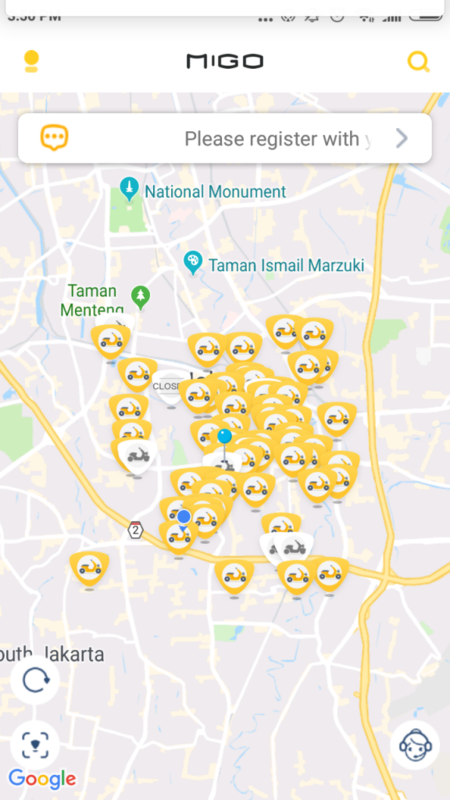 In China, a big issue with bike-sharing is that users sometimes intentionally vandalise the bicycles, but Yu has not seen the same thing happen in Indonesia. In Surabaya, the firm had launched the first generation of e-bikes, which looked more like conventional bicycles and have assisted pedaling. In Jakarta, it uses a different version—one that looks more like the Vespas or Varios that are commonly seen on the capital’s streets. Migo’s fleet now has 1,100 bikes, and the company has established 200 pick-up and drop-off points. They are mostly located in South Jakarta, and Yu’s idea is to achieve a high density in one district to make the service convenient for residents in the area. Yu says each bike is used twice a day on average. Migo points are clustered in one district for now. US$0.2 per half hour is not a promo rate, Yu affirms. That’s the price factored into the company’s long-term model. “This is a volume game. [Each bike] must hit a certain usage, then we get a return. We have to let people accept it at a reasonable price, then they will use it more frequently,” he says. However, the firm’s overhead must be significant. Migo wouldn’t share how much the firm spends on acquiring a single bike (they’re produced in China, but assembled in Indonesia). In addition to fleet procurement, Migo pays partners that serve as pick-up and drop-off points, even covering their electricity bills for the charging station. Partners agree to provide minimal maintenance like cleaning the bikes and helmets, but Migo also has its own team that visits these locations if maintenance is needed. A Migo partner told KrASIA he receives IDR 3 million (US$211) per month to manage ten bikes out of his convenience store. That’s not a small sum in Indonesia. The store owner also said that in the beginning, he saw many curious people wanting to test it out, but after an initial spike, interest tapered off. It’s mostly kids who rent them, he says. Migo requires users to be at least 17 years old, and an image of your ID needs to be uploaded during registration for approval. But that age policy seems hard to police in practice. The company has not run into any regulatory obstacles in Indonesia for now. The country’s regulators place electric bikes in the same category as bicycles. That means Migo’s bikes do not need to carry a license plate. But that might change, as we have seen with Go-Jek and Grab’s two-wheeler services. They were also previously unregulated, but new rules are catching up with them. At the moment, Yu and Migo CEO Tony Tau are focusing on getting as many bikes on the street as possible. The plan is to expand the fleet to 5,000 or 6,000 bikes by mid-year. Aggregating user data from all the trips and making insights accessible to third parties is one possible avenue for monetisation, Tau had told KrAsia’s parent company 36kr in an interview last year, just around the time of Migo’s Surabaya launch. Other cities in Indonesia are less attractive for Migo, says Yu, because mega-cities hold more potential. “Actually we will try to go overseas after Jakarta. To Bangkok, Manila, Ho Chi Minh City. There, people are using motorbikes heavily, the cities are big.” Yu believes conventional bike-sharing and scooters, which are becoming popular in the United States, won’t work in these cities. In Jakarta, Djoko Setijowarno, a public transportation expert from Diponegoro University and frequent commentator on Jakarta’s changing transportation landscape, is still skeptical about the concept taking off in the capital. He believes picking up and dropping off the bike at a station might prove to be too inconvenient for wide-spread use.